Michael Paterniti. Random House, New York, 2000. Talk about a zany roadtrip! 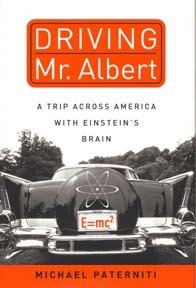 Imagine driving across America in a Buick Skylark with Einsteins brain floating in formaldehyde in a tupperware bowl in the trunk. That is just what Mike Paterniti did, with an 84 year old pathologist named Thomas Harvey riding shotgun. As a young man, Harvey had performed the autopsy on Einstein in 1955 — and kept the brain. He hid it in his house for over forty years, but now Harvey was returning it to Einsteins granddaughter. A pilgrimage through present time and past history, a meditation on Einsteins contribution to how we see the world and our place in it, a travelogue where the American dream is the constantly-recurring roadside attraction, this is a journey you wont want to miss. You will travel with a gifted writer, his practically certifiable passenger, their unique cargo — and a fourth passenger whose ideas about time have made an indelible impression on modern science and civilization.